10. Double Lives: An Autobiography. London: Cape, 1943. Reprint, Freeport, N.Y.: Books for Libraries, 1971. Opens with an epigraph in romanised Japanese and English translation of a verse by Hitomaro (Ap): ‘As the yû cloth is dyed fast and deep / Which ties the forelocks of the men / In the land of Hi, / So is my heart coloured with love: / How can I forget?’ The closing four-chapter section, ‘Not by Eastern Windows Only’, concerns Plomer’s life in Japan, and is a remarkable account for the date. Hatred of the country in England was at a peak, but Plomer’s writing is lyrical and loving, and tinged with the sadness that comes from memory of a happiness that has been lost in the years. 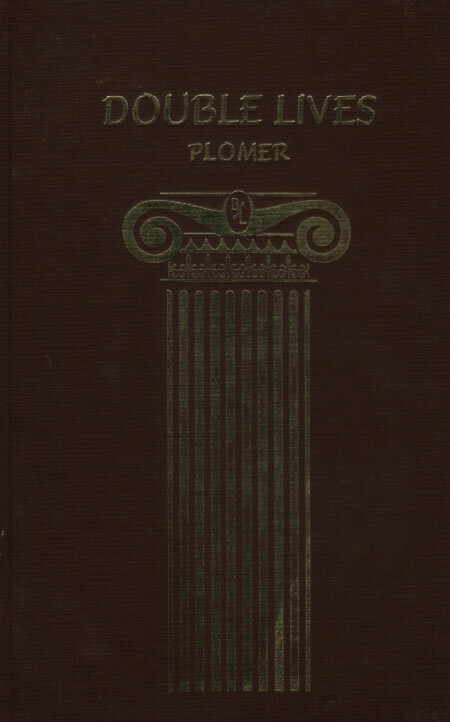 Three decades after publication of the work Plomer undertook revision of his autobiographical writings, and The Autobiography of William Plomer (24) appeared soon after his death. The four chapters on his life in Japan in that work correspond to those here. See Blunden’s review in BD51. a. ‘The Voyage’. Recounts the days before and during the voyage to Japan on the Canada Maru (see 7) and the whirlwind tour that followed, with Mori and Van der Post, from Moji to Kobe, Osaka, Nara, Kyoto, Arashiyama, Momoyama, Hieizan, Tokyo, Nikko, Ise, Hakone, Lake Chûzenji, and ‘several other places’, in ‘the most strenuous fortnight’ of Plomer’s life. He recalls that before the voyage his ‘ignorance of Japan and the Japanese was profound’. He had read Loti (Ap), ‘a few books by or about’ Hearn (D9), and ‘one or two dubious novels’, but ‘lacked sufficient curiosity or opportunity to enquire further into the nature, habits and surroundings of the Japanese’. Includes reference to the ‘classical lamentation’ of a shakuhachi played shipboard at night, its ‘evocation of what the Japanese call aware’ (from mono no aware, ‘the sadness of things’, an intermingling of sadness or loneliness and beauty), and to Plomer’s early introductions to the ‘the nefarious Japanese cult, or religion, of emperor worship and militarist nationalism’. The visit to the geisha house arranged by Mori recalls a description of a similar evening in Sado (5). For a more detailed account of the same events, recalled vividly after more than half a century, see Van der Post’s Yet Being Someone Other (38). b. ‘Kami Nerima’. Having seen off Mori and Van der Post on the departing Canada Maru at Kobe, Plomer was ‘alone in Japan’. He had little money, no friends, and only a few words of the language. He made his way back to Tokyo to seek out the company of Blunden, ‘that fine poet and good-hearted man’ (though see 27a1), who arranged his appointment to the faculty of the Tokyo gaikokugo gakkô (foreign language school) and introduced him to Ichikawa Sanki (Ap), who in turn arranged a better job at Tokyo kôtôgakkô, an elite school that prepared students for entrance to the Imperial University. After living for a time at the Kikufuji Hotel, Blunden’s address as well (see BD166j), and then at a less expensive establishment yet (neither of which, notably, are mentioned here), Plomer moved to Kami Nerima, then a picturesque village outside Tokyo, where he shared a traditional Japanese house with a student named Sumida. Their life during this time was ‘good’, Plomer recalls, with ‘periods of not uncongenial work’ and ‘long holidays in which to explore and savour the country and cultivate private life’. He describes various travels, to Kamakura, Tarumi, Mikage, Hiroshima, Miyajima, and Hokkaido, and his friendships with Sherard Vines (Ap) and with Sumida and his fellow students. Plomer loved both the natural beauty of Kami Nerima and the excitement of Tokyo, a city ‘electrical with life and . . . of inexhaustible variety’. His writing here makes clear the degree to which he accepted and savoured the customs and traditions of Japan and the company of Japanese friends and acquaintances. c. ‘Higashi Nakano’. When Sumida’s parents arranged their son’s marriage, Plomer moved closer to the city, to another traditional house, in Higashi Nakano, in late 1927 still ‘peaceful, with quiet byways among gardens full of evergreens’. There he ‘did a great deal of reading and writing . . . and a great deal of merrymaking’. A new companion, Fukuzawa Morito, like Sumida a student at the kôtôgakkô, is recognisable in the character of Sado Masaji in Plomer’s novel Sado (5). They shared the house with a young woman ‘who had had a stormy adolescence and was glad of a haven’, and frequent guests, young Japanese whose ‘society’ Plomer enjoyed or who ‘needed a temporary refuge from family or other troubles’. Fukuzawa was a lover of Japanese literature, and introduced Plomer to important works ancient and modern—Saikaku (Ap) and Natsume Sôseki (Ap) are particularly noted—and the two often attended the bunraku, nô, and kabuki, where Plomer learned that ‘the art of acting’ in Japan ‘has attained perfection’. Includes loving recollections of the pleasures of the Japanese bath and of sake, excerpts of letters to Plomer from Japanese friends, and a description of the ‘two poles or antitheses of the Japanese character’, represented by Fukuzawa and Mori, recalling similar passages in Sado and ‘The Brutal Sentimentalist’ (3e). Remarkably, one of Plomer’s neighbours at Higashi Nakano was Yone Noguchi, ‘lean and sardonic-looking’ with ‘an air of having burnt his candle at both ends’, author of ‘inveterate’ poems composed ‘in a bizarre English of his own’, but nonetheless ‘sensuous and novel’ (see especially D15e1 and 4), and of ‘monographs on Utamaro and other artists’ (see D15e and e8) that Plomer believes ‘are possibly of more lasting value’. The last news Plomer had of Noguchi, he writes, was that the old man was ‘a confirmed xenophobe’. d. ‘The Torch to Ties’. Though in Japan Plomer savoured ‘the pleasures of society and solitude, of travel, of the theatre and the bath’, and believed for a time that he might make a life in the country, writing ‘much and originally’ of its people, ultimately he felt compelled to ‘tear [himself] away’, and ‘the pangs were great’ (see also 12). He was early and keenly aware of a ‘double life’ in Japan (see particularly 3e, 9, and 10c), and if his ‘love’ for the country was ‘an infinite enrichment’, his ‘hatred’ was no less profound, an awareness that with the hindsight provided by the forties he knows was ‘justified’. Includes passing reference to work by Bashô (Ap) and Basil Hall Chamberlain (see D5), and accounts of journeys in the summer of 1928 to Lake Kawaguchi and the ‘dreadful mountain-resort Karuizawa’. The book ends with a lyrical passage about what Japan meant to Plomer, written during the height of British and American hatred of the country: ‘Civilization has many dialects but speaks one language, and its Japanese voice will always be present to my ear, like the pure and liquid notes of the bamboo flute in those tropical evenings on the Indian Ocean when I heard it for the first time, speaking of things far more important than war, trade and empires—of unworldliness, lucidity and love’.